HTC Vive is celebrating the second anniversary of its launch by giving you free VR games. Awesome, right? It's really rather simple: if you own a Vive, you can get four VR games at no cost through 11:59 pm PT on April 5 (tonight), or 2:59 am ET / 7:59am GMT / 4:59pm AEST on April 6. The four free titles are Front Defense, Front Defense Heroes, Super Puzzle Galaxy Lite and Arcade Saga. Considering two of these games are regularly $19.99 (about £14 / AU$26), today is a good day to go shopping. The HTC Vive birthday goodies don't end there, though. If you have a Viveport Subscription or sign up for one before April 8, you can get an additional title, Everest VR, also for free. Funny enough, now's also a good time to sign up for Viveport since you can save 50% on a three-month subscription at the moment. 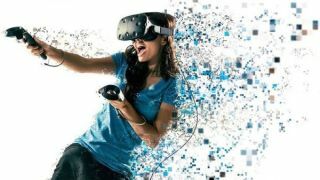 HTC is clearly looking to reward its Vive user base with these promotions, and perhaps entice a few new users to order their own headset and join Viveport. Two years is a long time to last for any product, especially one in the nascent world of virtual reality. HTC recently reduced the Vive price to $499 / £499 (about AU$615), which is only $100 / £100 more than main rival Oculus Rift. The move has made the HTC Vive an even more enticing product. The giveaways also come as the HTC Vive Pro goes on sale. At $799 / £799 (about AU$1,015), it's an expensive buy, but does offer superior resolution to the original HTC Vive. Free games are available now, HTC Vive owners. Get 'em while they last.